It’s difficult to overstate how significant the HyperGravity Compressor could be for guitarists (and bassists) seeking the best in high quality dynamics control. A common complaint among guitar compressors is how sometimes certain frequencies are compressed in a way that causes a “loss of tone”. Often it’s the nature of certain analog components to reduce high or low-end content when compressing a signal, or they simply color your tone in general. Other times you’d rather apply more or less compression to certain frequencies than others. An example would be taming high-end peaks or brighter sounds only. Maybe you need to reduce that ‘booming’ low-end or apply compression that evens out your sound across the tonal spectrum. 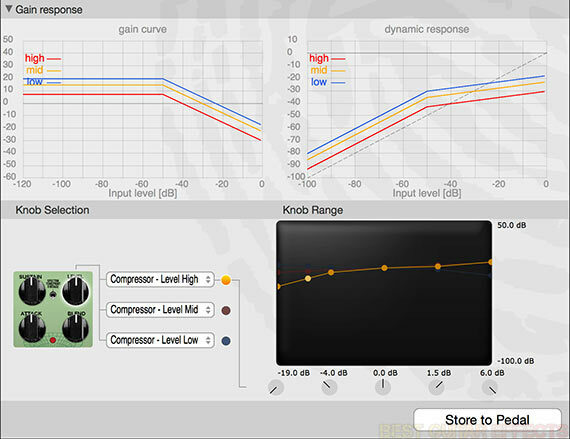 Multiband compression provides greater possibilities for precision compression than any other method. We’ll go into greater detail about multiband compression and the TonePrint Editor in as the vacuum pulls us deeper into our HyperGravity Compressor review. Here’s a quick feature rundown and commentary before we continue. 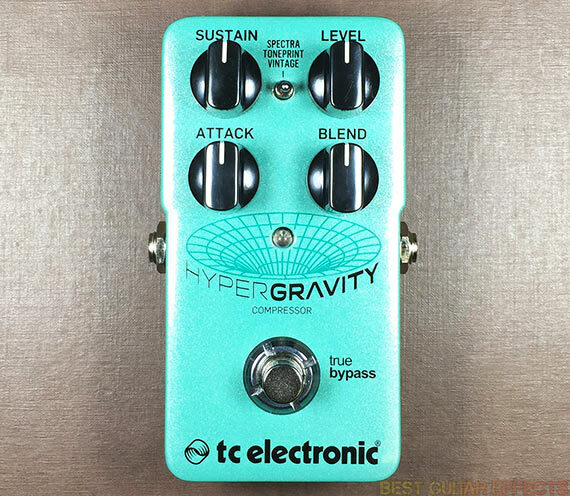 The HyperGravity Compressor comes in TC Electronic’s familiar standard-sized pedal enclosure like the Vicous Vibe, Helix Phaser, & Ditto Stereo Looper. The pedal has a nice solid feel and should carry on the tradition of rugged and reliable performance TC Electronic is known for. It also has the familiar true relay bypass footswitch which activates/bypasses the pedal pretty quietly. If you use batteries, the backplate comes of with a single screw that you can unscrew with a nickel or 2mm guitar pick, a handy touch. There’s not much to see inside otherwise as TC Electronic covers the PCB with black plastic which also prevents accidental damage when you replace batteries. Visit TC Electronic for more info about the HyperGravity Compressor. We’ll start simply with the HyperGravity Compressor’s out-of-the-box capabilities. As many guitarists just want to plug in and play, it’s important to assess what this pedal offers right away. Let’s start with the Spectra mode as this is the most exciting default aspect of the HyperGravity. The Spectra mode provides an already optimized multiband compression preset that’s meant to be suitable for most general compression duties. First off, in terms of tone, the HyperGravity Compressor’s Spectra mode is astoundingly transparent. Tone is uncolored, clear, and true to your guitar. All your ‘tone-sucking’ nightmares from using lower grade comps can now become sweet dreams. As expected, the default Spectra algorithm does perform an excellent job at evening out your guitar sound across the frequency spectrum. The mids don’t get overly squashed, the high end isn’t killed, and your low-end doesn’t disappear. The guitar sounds very natural, yet a little more balanced. 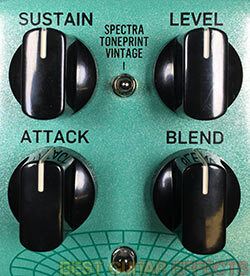 What it does is very subtle but absolutely essential, and I imagine Spectra mode becoming the preferred setting for most guitarists that buy this pedal. To sidetrack from this review for a moment, whenever I install a new humbucker into a guitar, I spend a lot time obsessing over adjusting the pole pieces to even out the string response as much as possible. Unfortunately, single coils typically don’t have adjustable screws, and you’re stuck trying to angle the pickup just right (or adjust your bridge’s string saddles if you’re that obsessed) to find an acceptable balance at best. And I won’t go into string gauges & materials or how note tonality differs at various areas on the neck. But what I’m getting at is Spectra mode basically takes whatever you play, wherever or however you play it, and creates a more sonically pleasing result through its balancing of your sound. Even if you have a beautifully set up instrument and impeccable tone control from your hands and hardware, the HyperGravity Compressor will still be a great addition to further refining your masterfully crafted tonality. To get a little more in-depth with Spectra, my favorite fully wet compression settings were at lower Sustain settings around 9-10 o’clock. This provides a more subtle general compression sound for evening out your tone and really shines with chords and clean tones. As you increase the Sustain towards noon or higher, you’ll might notice that the release times are a bit slow. This sounds better for blooming chordal work. You’ll also notice more ‘pressure’ being applied to your signal, a sort of sonic gravitational pull you could say. If the dynamic squeeze becomes too heavy, you can use the Blend to pull your signal out of this tightly compressed orbit. Your guitar’s original prominent tones will breath above the HyperGravity’s atmospheric threshold. Conceptually and in practice, Spectra mode is a unique take on the typical concept of compression. But as we’ll get to in a moment, even more multiband compression fun is had when you dig in with TonePrints & the TonePrint Editor. But let’s talk about Vintage mode first. As mentioned previously, the HyperGravity’s Vintage mode is TC Electronic’s emulation of the earliest guitar compressor pedals. While many boutique builders have refined these classic designs over the years in pursuit of a more transparent and pure tonality, TC Electronic opted to recreate that darkly colored sound of the oldest vintage compressor pedals. This will be a matter of taste preference for most guitarists and you may either love it or hate it. Vintage mode is certainly darker than any of the noteworthy modern Ross/Dyna Comp inspired pedals, although the compression response is certainly just as pleasing as the best of these compressors available. The compression is warm and colorful, but if you want to brighten things up a bit you can always Blend in some of your dry guitar signal. It almost seems like TC Electronic made Vintage mode so dark to be in extreme contrast to the sublime purity and transparency of Spectra mode. 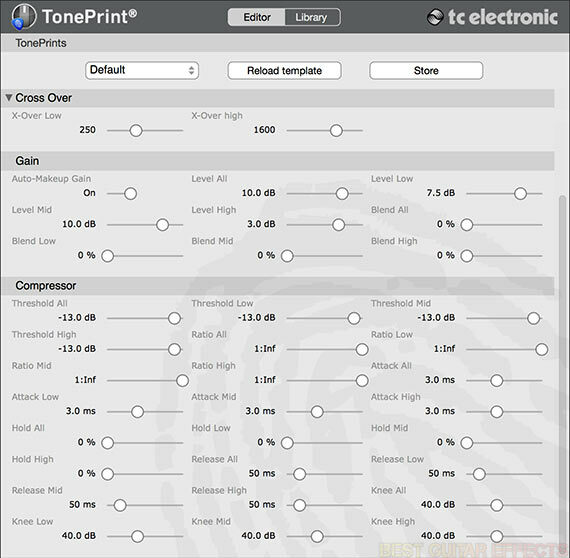 But if you’re not feeling these presets modes or are still seeking something a little different or more tailored to your needs, the TonePrint option has it covered. While the default modes cover a couple diverse flavors of compression, I’d highly recommend finding or creating a TonePrint that’s best suited to your playing style or that offers yet another diverse compression sound to recall when needed. I enjoyed the Stratocomp, 3BandDynaQ, and Compander TonePrints in particular. These and other TonePrints serve to help you get acquainted with the HyperGravity’s possibilities before you go diving into the TonePrint editor to tweak things to your liking. We previously went in-depth with the TonePrint Editor in our TC Electronic Flashback Mini Delay and Flashback X4 reviews, but the customization control that you have over the HyperGravity Compressor takes it to the next level and gives you far more control than typical compact guitar pedals. To ease into the insanely deep control you have over crafting HyperGravity Compressor presets in the TonePrint Editor, it’s good to start with existing templates and go from there. For example, while the Stratocomp TonePrint changes the function of the Level knob to control the levels of highs, mids, and lows for a traditional ‘tone’ knob function, I removed the Level Low parameter from the knob to make it more of a ‘High-Cut/Boost’ knob. Not that a typically bright sounding Strat needs a high-end boost, but this gave the preset a little extra versatility when playing a darker, humbucker-equipped guitar. Another fun and easy tweak was to turn the 3BandDynaQ TonePrint into a simple 3-Band EQ. I just removed the compression and changed the ‘Threshold’ knob to control ‘Level All’ while making a few tweaks to the crossover points and boost ranges. This transformed the HyperGravity into a great 3-band digital EQ where I could boost or completely cut individual frequency bands or achieve a flat-clean boost with accents to certain frequencies if needed. That’s 35 different parameters, and each of the HyperGravity Compressor’s 4 knobs can control up to 3 parameters each. TC Electronic went beyond the kitchen sink with this one. It’s literally like having 3 different fully-featured compressors working simultaneously on your signal in 3 different frequency bands. I did encounter a few minor bugs when editing and using TonePrints. On the TonePrint Editor for iPad some parameter values displayed incorrectly when I clicked on a different knob and then clicked back to the previous knob. A more serious little glitch occurred when testing out my 3-Band EQ TonePrint. Typically, I could adjust the levels of individual bands via dedicated knobs and then adust them together with the master ‘Level All’ knob just fine. But if I lowered 2 of the bands completely and then slightly raised the master ‘Level All’ knob, the remaining audible band would suddenly spike to maximum volume. The lesson learned here is to carefully test your TonePrints. Some unorthodox settings could cause unexpected results. But generally, saving and using TonePrints worked well, and all of TC Electronic’s own TonePrints worked fine. One concern I had going in was whether the HyperGravity Compressor would hold a candle to the great analog compression pedals I’ve had the joy of playing. Is it as good? In a word: yes. In two words: Hell, yes. While TC Electronic doesn’t make a big deal about tech specs and processor speeds, etc., I did find out from TC Electronic that the HyperGravity processes and converts audio at a respectable 24bit/48kHz if that sort of thing matters to you. But most importantly, the HyperGravity sounds great, is soundwise latency free, and has arguably the most transparent guitar compression you’ll find in a pedal this small. Surprisingly, the HyperGravity Compressor isn’t necessarily any quieter than other analog compression pedals that are noteworthy for their near-silent operation and low noise-floor, although it is on par with the best in this area. I was just hoping for exceeded expectations and a new standard in quiet digital pedal compression. But the compression sounds produced are smooth and latency-free, so it can most definitely fulfill ‘always-on’ duties just fine. Aside from the few little TonePrint related glitches, my most annoying gripe with the pedal is the slight latency that occurs when turning a knob and not immediately hearing the change taking place. This makes it take slightly longer to find unity gain, and you’ll often hit parameter spikes when turning a knob too far. These are things I hope can be corrected via a software update. Also, while the Vintage mode is a great colorful option for those yearning for old-school, dark compression, I could name a half-dozen modern ‘Ross/Dyna Comp’ inspired pedals I prefer. Maybe the current ‘dark’ Vintage option could be an optional TonePrint, and a somewhat less dark yet still vintage sound could be the default. Ideally, I wish TC Electronic would allow users to set 3 custom TonePrints to the 3 switch positions. That way you could assign a great multiband sound to the Spectra position, a (brighter) “Ross/Dyna Comp” sound to the Vintage position, and then any other traditional or experimental sound to the TonePrint position. In the meantime, I’ll be keeping a hawk’s eye out for any firmware updates regarding better custom TonePrint stability, fixing knob latency, quieter operation (not that the noise floor is really an issue), and/or a 3 custom TonePrint option if wishful thinking helps. But in terms of versatility, no compact pedal this size can match the possibilities the TC Electronic HyperGravity Compressor offers. The TC Electronic HyperGravity Compressor offers a wider range of high-quality compression sounds than any other compact pedal. Thanks to its studio-style multiband compression algorithm, you’ll achieve greater dynamic control than with any pedal that’s come before it. While its sound-quality is impeccable and the pedal is great as it is, I’d like to see a few software tweaks to make it perfect, particularly to correct the knob latency. Fortunately, the sound quality is so good that these few issues shouldn’t be a dealbreaker. The sounds, versatility, and value that the HyperGravity Compressor offers are outstanding, making it one of the best modern compression pedals around. That concludes our TC Electronic HyperGravity Compressor review. Thanks for reading. 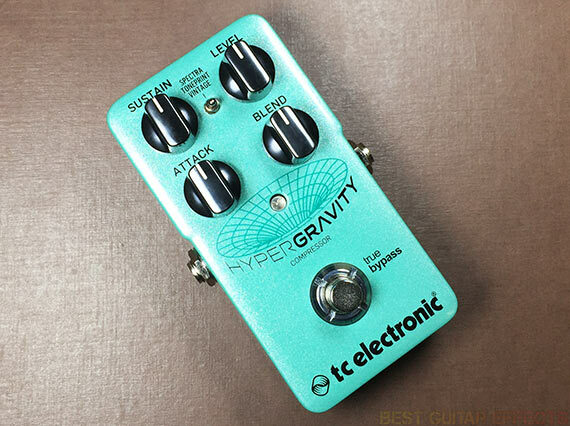 Want to buy the TC Electonic HyperGravity Compressor? 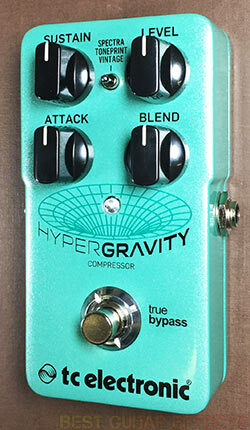 Love the Hypergravuty compressor. I’m still using the on board presets and I’m quite happy with the sound,clean transparent ,perfect for bass and guitars. Like I said , the features are impressive but it just doesn’t sound good…. I always feel a relief to hear my guitar’s tone when I turn it off…. Seriously,.. Can someone please give me a setting that is similar to the super easy to use SP comp? It sounds so sweet, kicky attack and endless sustain… This is sterile like most TC’s stuff… It’s wuality, but too damn digital… Like their flashback delays… No warmth or nothing… Definitely coming off my board. If I want multiband compression I’ll stick to vst’s … For performing live nothing beats the SP compressor or the Ego by wampler or even the Warden Optical compressor… In the meanwhile, stay away from this pedal. Ant opinions on Moooer yellow comp ? thanks. Are kidding me man,the Hypergravity compressor has a great sound ,if you don’t llike it,then don’t use it but don’t put a bad name on the Hypergravity because it’s the best compressor out here in a stomp box.And when you say that Flashback delays sound sterile,maybe your ears are sterile.I have the Flashback Trip,e delay and Alter Ego X4 and they’re the best sounding delays for me.Tried Timeline,Empress ,yes they’re good but too digital sounding.TC rules everyday!